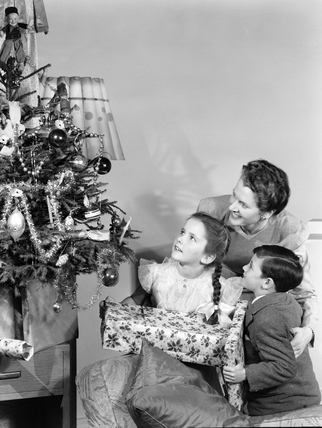 Hope everyone enjoyed the holidays. If you got a bit bored of watching re-runs of the soaps while chewing on leftover turkey, you could have entertained yourself by tuning in to the Royal Institution’s Christmas Lectures. This year, materials scientist Mark Miodownik talked about everything from chocolate to elephants and you can still catch the lectures on BBC i-Player. The RI’s Christmas Lectures began in 1825 and have continued ever since, pausing only during World War II. The roll of past lecturers includes such famous names as David Attenborough and Carl Sagan. But the person who’ll always be most associated with the Christmas Lectures is their founder Michael Faraday, with 19 of the annual series to his name. Faraday first gave the festive lectures himself in 1827-8. 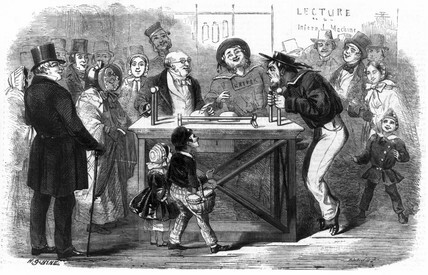 His series of family lectures on chemistry wowed audiences and the press. By 1855, when this lithograph was made, lecture-goers included such distinguished guests as Prince Albert. 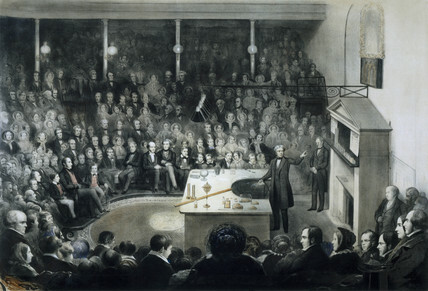 The Royal Polytechnic Institution, famous for ‘abominable smells and… the odd explosion’, also started running a popular series of Christmas lectures. Such shows became a festive feature at institutions around the country.